We are offering our client an excellent quality range of PET Resin. 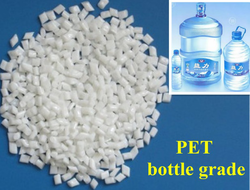 Bottle-grade polyester chips are suitable for making the packing bottles for pure water, natural mineral water, distilled water, drinking water, flavoring and candy containers, PET sheet material. We manufacture recycled PET Resin since 2010. Our resins are of the highest quality and are made in latest machines and are free from contaminations and are as good as fresh resins. Our natural resins can be used with virgin/fresh resin to make preforms and bottles without affecting color and physical qualities of the final product. High IV Amorphous PET Chips, also known as Polyester Chips or Polyethylene Terephthalate Chips used for making Preform, Monofilament & Sheet. Indorama Ventures is the 2nd largest PET resin producer in the world. Indorama Ventures has grown rapidly over the past few years with start-up of greenfield plants in Lithuania and USA, and acquisitions in USA, Netherlands, and the United Kingdom. Neeta Chemical (India) Pvt. Ltd.